Meihuazhuang lion dance leads parade. County folk art festival February 1998. The Canadian Meihuazhuang Association has begun work to create a documentary film about meihuazhuang and its function as a folk organization in rural China. Possibly the first of its kind, this documentary will illustrate the function of rural folk martial arts organizations and the role they serve in rural Chinese society. If you enjoyed our unique website, please help us by making a donation to our grassroots project. The social function of meihuaquan in rural society. In areas of north China where the Boxer Rebellion of 1900 began, martial arts organizations are an integral part of rural culture. Film footage documents the lives of the rural people and the complex interrelationships between folk martial arts and evolving society. 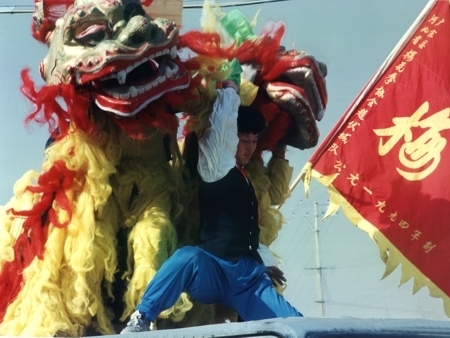 Incorporating interviews with historians, sociologists, cultural researchers and martial artists, the film illustrates how fascinating and colourful performances and rituals of the folk martial art 'meihuaquan' act to promote unity, mutual aid and the transmission of a unique historical legacy of practices and ideas. Filmed in China primarily in 2003-2004, the documentary is supplemented with rare vintage video footage and photos. filming 70% complete — footage includes interviews with noted historians, sociologists and researchers. If you share our interest in this work, please make a donation &8212; we welcome individual and group contributions. The Association is run on a not-for-profit basis and all labour is done by volunteers and enthusiasts like you. Your donation directly supports the completion of important projects. Contributions will be used to pay for essential equipment such as videotapes, photographic film, video editing and finishing expenses. Please visit this page often for updates on the status of projects. Your funding and financial support is greatly ppreciated. Donations can be made to: Plum Flower Society, Bank of Montreal, 438 Victoria Ave, Regina, SK Canada. Transit Number 0552. Donations online through PayPal also gratefully accepted by sending to ji4mou2@email.com. 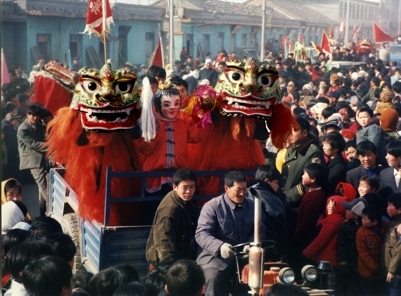 The film will document the vibrant folk art festivals which take place annually at Chinese New Year. 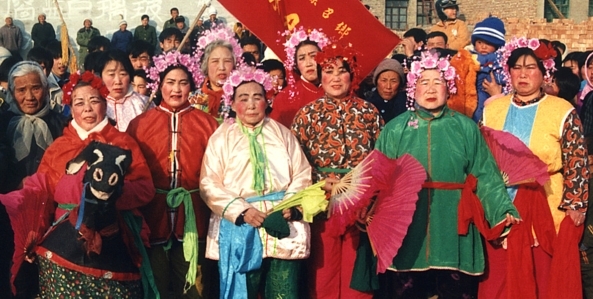 Meihuaquan and folk arts/dance teams congregate in the county capital (1998). This project was conceived perhaps originally in 1992, when meihuazhuang master and Shandong University professor Yan Zijie arranged a trip for Alice Lee and myself to the meihuazhuang homeland regions of rural Hebei province. At that time, we were very much impressed by the large-scale, vivid martial arts performances organized by local meihuaquan practitioners. Even more impressive was the fact that meihuazhuang (or meihuaquan as it is referred to in most rural areas) appeared to be very prevalent the region. In subsequent trips to the region in the years since, it became apparent that our observations were correct — meihuaquan is embedded in the social fabric of hundreds of villages scattered across many counties. It is estimated that at 30-50% of the population in Guangzong is involved in meihuaquan. An inherent part of rural culture, people practice well into old age. 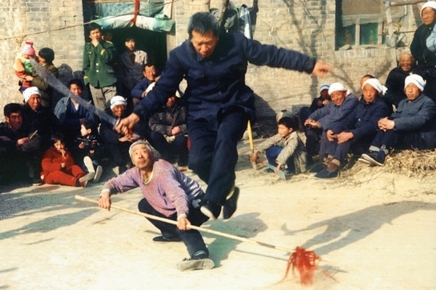 In the winter, free of agricultural duties, martial arts are an important leisure activity. In this photo, middle aged teachers demonstrate their skills. In 1997-98, working on a CIDA sponsored project examining how cultural tourism based on folk arts could be used for economic development in the region gave me the chance to do extensive fieldwork in the villages of Guangzong county, Hebei. After speaking with many followers of meihuaquan, it became obvious that this ancient art, passed down for centuries, is regarded as far more than a martial art for fighting. Rather, it held as a sacred practice — a means of spiritual cultivation — and an important form of education for youth. Local people call it "the wordless book of truth", and in the villages it serves a means of resolving conflict through mediation, and as a grassroots social organization through which rural people scattered over wide areas provide labour and economic assistance for one another. Bond by strict codes, adherents never teach martial art skills for money, nor do the healers or other divination experts accept money or payment of any kind. Their spirit of solidarity and mutual aid so strongly upheld by the followers is inspiring. Through contact over many years, I have come to understand meihuaquan as social movement — strong, modest people united by belief in equality, mutual aid and unity. Folk martial arts abound in the border region of Hebei, Henan and Shandong provinces. Focusing primary on meihuaquan�s martial festivals, the documentary will touch on other folk arts in the region. 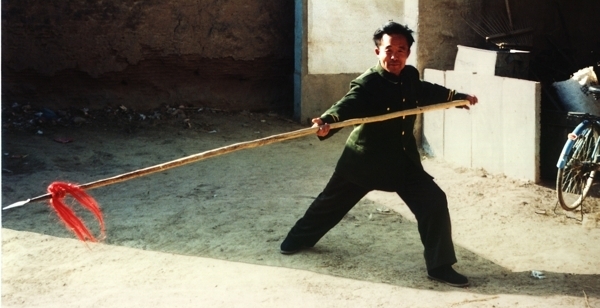 In this photo, an elderly practitioner of the martial art, Hongquan, demonstrates double-broadsword. In these regions, meihuaquan and hongquan have a close, age-old relationship and perform martial arts together on certain festive occasions. Of course meihuaquan co-exists alongside several other folk martial arts and a wide variety of traditional folk arts. So abundant and well preserved are these arts that the Guangzong County government was awarded by the state the titles of "Homeland of Meihuaquan" and a national award praising the county as "Homeland of Folk Arts". It is this dynamic mix of folk arts which brings together men and women, children and the aged to participate in the regions diverse assortment of festivals throughout the calender year. Since 1998, we have had several opportunities to return to the area to continue learning about meihuaquan and folk martial arts in this region. While filming Phase 1 in September 2003, one particular incident left an indelible impression. Since we were particularly interested in learning more about the role of women, especially women meihuaquan teachers, we met an old master and his wife who in an isolated wooded area far from the village. I had met them on many occasions years before but had no idea that she also practiced meihuaquan. As we talked with them, and the incredibly spry 80 year old woman explained that she began studying meihuaquan when she was in her thirties because she was worried about her health. As she and her husband gathered their students for a demonstration, she added, "Ever since that time" she added "I�ve been very healthy. I seldom fall ill!". After some encouragement, the old woman picked up a sword and her husband, quite famous in those parts, gave her suggestions on posture and training. Caring for each other for decades, their entire lives have revolved around teaching both martial arts and healing illnesses of rural people who seek their expertise. 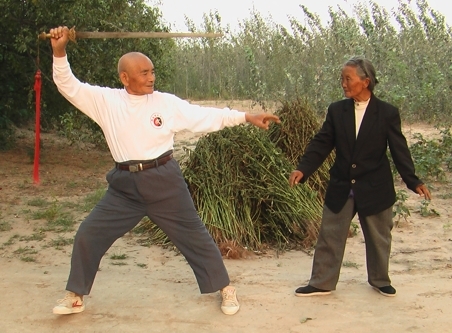 Meihuaquan master Xing (age 77) and his wife (age 80) review a swordplay routine before their students. 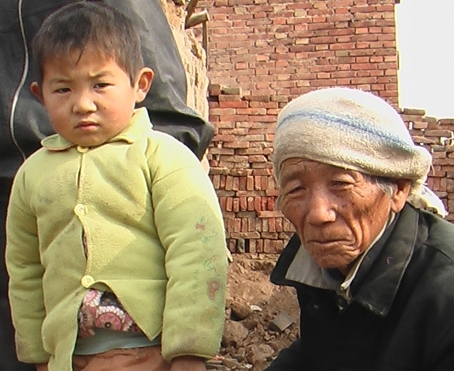 They have taught meihuaquan to generations of disciples in their village. November 2003. Several months later, I returned to visit them again in November. Noting the penetrating cold, one of us asked him why they haven�t lit the stove for heat. His wife replied quite innocently that they didn�t believe in using heat during the winter "heating a home in the winter is unnatural and unhealthy". All of us, including several Chinese friends visiting his home, marvelled at their robust health and vigorous, happy personalities. A village team gathers regularly at the home of their master who taught his many disciples in the courtyard of his home. Carrying on tradition, the disciples train the next generation on the very ground, in the very home where they themselves learned more than 50 years ago. 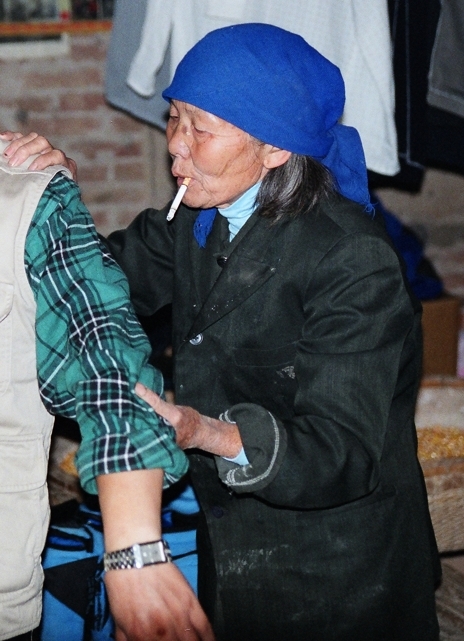 A woman wenchang master provides treatment to a patient. Women teachers in meihuaquan play an important role in some villages serving to mediate disputes, treat illness, and make predictions and foretell future events. Wenchang teachers, both male and female, play crucial roles in impoverished areas where social welfare and medical services are essentially non-existant or nearly completely inaccessible. We have undertaken this documentary for several reasons. 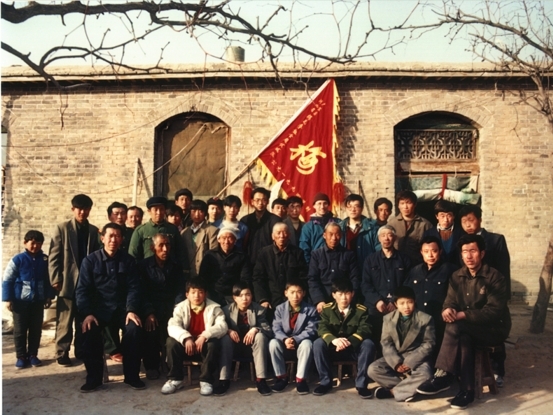 Meihuaquan is a grassroots organization run by rural people in past dynasties as a way to promote solidarity, protect themselves against bandits and an oppressive ruling class. This strong tradition of unity, mutual aid and comradeship has continued to this day and has forged a rural spirit which honours friendship, and builds lifelong bonds between people, villages and districts — it unites them in a common belief in Art. From an academic perspective, research in the West, China and Japan indicate that there is very little written material available on folk martial associations and their role in society. So from this vantage point alone, this film will provide a unique opportunity to shed light on this ignored, poorly-understood aspect of human society. The film can inspire us with the story of a people who have endured centuries of hardship, but united through their art, found strength to thrive and lead meaningful lives based on strong friendships. 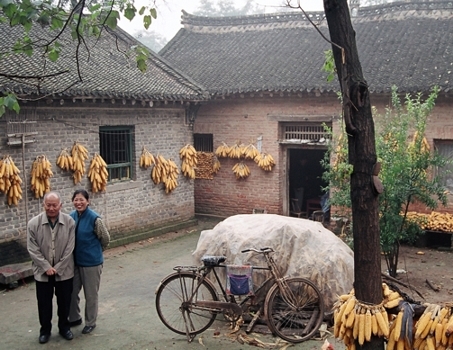 Meihuaquan creates a living, dynamic relationship and link between the elderly and the younger generations. Elderly Wenchang practitioners of divination and healing are seen as custodians of the Art, and are looked to for advice and their knowledge. 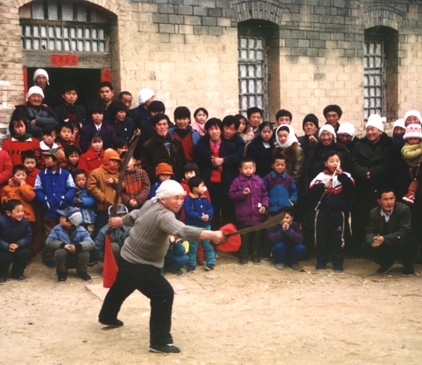 More importantly, because folk martial arts were until recently banned as superstitious practices, foreign interest in meihuaquan and the folk martial arts and art traditions of this region has been instrumental in bolstering rural people and local government pride in their folk arts. This has led to an overall strengthening and revival of rural folk traditions. A significant portion of any monies earned through the production of this documentary will be donated to rural regions to help support rural meihuaquan associations and folk art groups which contribute greatly to the quality of life in these regions. Donations to support this project are both necessary and appreciated. Meihuazhuang master Yan Zijie and his wife lead our research group to Dongming county to interview women meihuazhuang masters. Over the years, professor Yan, his wife and family have led many groups of foreign visitors to the meihuaquan homelands. We are truly grateful for their unceasing efforts! The Association extends deep appreciation and thanks for the financial and logistic support provided by the International Folk Culture Association of China, our head organization — the International Meihuazhuang Organization (Jinan); and to the Guangzong County government for their generous and assistance and support of meihuaquan, folk martial arts and folk culture in Guangzong County. We express our most sincere appreciation to the people and meihuaquan practitioners and masters of Guangzong, Pingxiang, Wei and Dongming counties. Without their sincere interest, patient discussions and explanations, this project could not be undertaken. Our gratitude is extended to the professors and researchers at Beijing University, Shandong University, and Jinan Art College for granting us interviews and contributing to this project. Last but never least, deepest gratitude is extended to meihuazhuang master Yan Zijie for his untiring efforts to teach meihuazhuang in China and abroad and for supporting and organizing so many fieldtrips to the rural meihuaquan homelands.